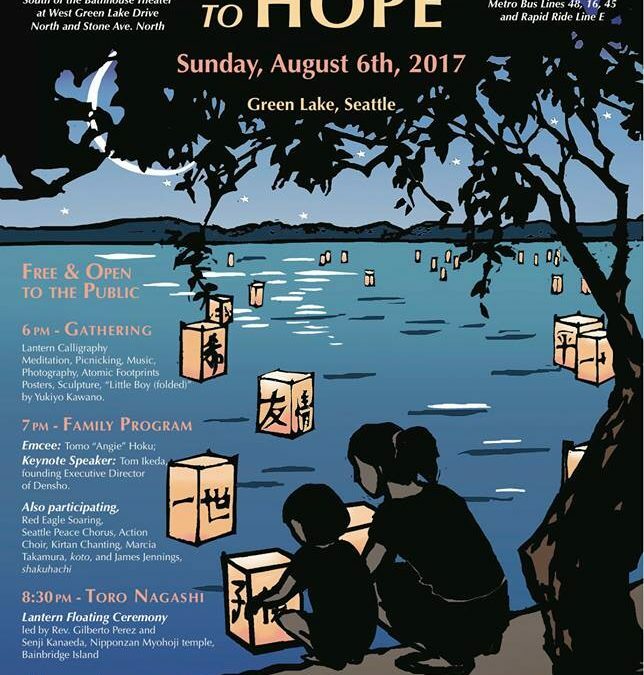 Annual peace event honoring the victims of the atomic bombings of Hiroshima and Nagasaki and all victims of war and violence. Pre-program activities begin at 6 p.m. and include lantern calligraphy and folding of peace cranes. A family program with music and speakers begins at 7 p.m. The program features Tom Ikeda, founding director of Densho, an organization dedicated to preserving the story of World War II-era incarceration of Japanese Americans. Performers include the popular Japanese-American drum performance group, Seattle Kokon Taiko. The candle-lit lantern ceremony begins at 8:30 p.m. The event also includes the exhibition of artist Yukiyo Kawano’s fabric sculpture “Little Boy (folded),” a full-scale replica of the Little Boy bomb dropped on Hiroshima on August 6, 1945.